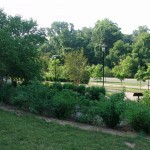 Click on each image to view it in a larger format. 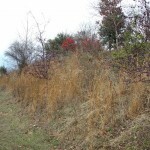 Reforestation slope with identification sign. 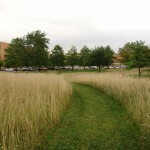 Rain gardens with meadow in between stabilizing slope and reducing the area that must be mowed. 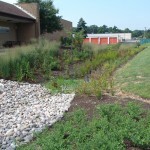 Rain garden on slope to intercept water before it reaches a low area. 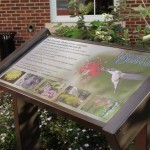 Sign explaining sustainable aspects of Visitor Center landscape. 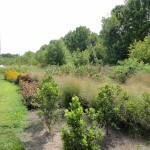 Visitor center landscape with a wide variety of trees, shrubs and perennials. 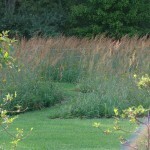 Dense planting supports many birds and insects that are attracted to native plants. 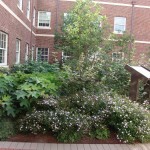 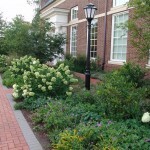 Plantings were designed to fill in and do not need yearly remulching. 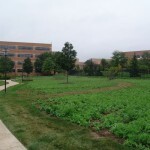 Rain garden at CFA adjacent to parking garage. 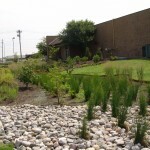 Planted bioswale at New Castle County Extension office catches rainwater from parking lot and improves infiltration. 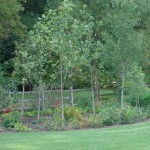 Plantings filled in and started taking up water the first season after planting. 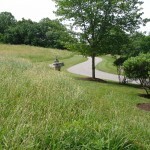 Unmowed lawn becomes an attractive meadow with a cleanly mown path. 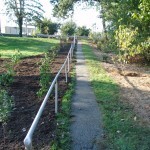 Employee effort to clean out (remove invasive species) and replant forest area to attract wildlife and provide employee gathering spaces. 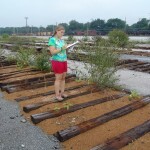 Collecting data on a research project at the STAR site to learn about strategies for re-vegetating a former industrial site. 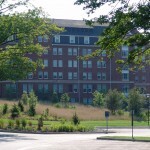 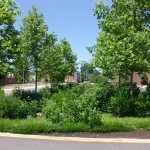 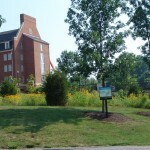 Residential landscape in Delaware with meadow as a front lawn rather than mown turf. 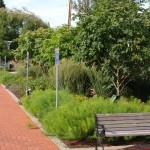 Naturalistic plantings on residential slope adjacent to road.